Boston: Newbury Street Press, 2006. Available from AmericanAncestors.org . Published 6 Dec 2006 for the New England Historic Genealogical Society (NEHGS) by the Newbury Street Press. 7 x 10 hardcover, $60.00. Orders may be made at the NEHGS website AmericanAncestors.org . Riggs volume 1 was conferred the Donald Lines Jacobus Award by the Fellows of the American Society of Genealogists (ASG) at their meeting in Salt Lake City on 13 Oct 2007. 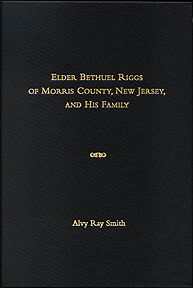 For further informatio n .
This book, the first of a five-volume series on “Edwardian Riggses” by Alvy Ray Smith, is devoted to Bethuel Riggs, a Revolutionary War veteran and Baptist preacher and church founder, and to five generations of his and his wife Nancy Lee’s family. The expression “Edwardian Riggs” refers to those in the same genetic family as Edward Riggs, immigrant to Roxbury, Massachusetts in 1633. Bethuel Riggs was born in New Jersey, probably a sixth-generation descendant of Edward Riggs. He was stationed in the Revolution there, in western Pennsylvania, and in North Carolina, participating in the Battle of King’s Mountain. As an “elder,” or minister, of the Regular Baptist faith, he started several churches while moving west from North Carolina and Georgia to Kentucky and then Missouri. His movements mirrored those of Daniel Boone, an older contemporary, the two families living in the same locales and their histories intertwined. Religion runs deep through this genealogy. Bethuel and Nancy’s daughter Margaret married into the family of Elder John Corbly, another Revolutionary soldier and church-founding Regular Baptist minister. Bethuel’s youngest son, Nathaniel, became an early Mormon under the influence of Joseph Smith Jr., marched in Zion’s Camp, and followed Brigham Young to Salt Lake. Nathaniel’s story brings into this book a principal apostate to orthodox Mormonism, J. J. Strang. Bethuel and Nancy’s children populated early Cincinnati and area (including northern Kentucky) via marriages to the Webb, Corbly, Armstrong, and Millspaugh families; the Lincoln County area of Missouri via marriages to the Smith, Sitton, and Turnbull families; parts of Texas via marriages to the Shaw, Gililland, and Webb families; and of course to Utah and adjoining states via the Mormon migration and marriages to the Boren, Kerby, and Mortenson families. The book makes large genealogical contributions to 75 surnames and minor contributions to over a thousand others. Mentions 1,128 descendants. Additions, corrections, and additional illustrations and appendixes at alvyray.com/Riggs/vol1. Includes 34 illustrations, some in color; 11 appendixes; bibliography; full name index. This remarkable volume is the first in a projected series dealing with the "Edwardian Riggses." The term refers to various families where Y-chromosome DNA of descendants links them to Edward1 Riggs of Roxbury, Massachusetts. While the DNA of Bethuel Riggs, born in Morris County, New Jersey, in 1757, matches that of Edward1, he may either be descended from Edward or from an earlier common paternal ancestor. Beginning with a nearly fifty-page biography of Bethuel himself, a peripatetic Baptist Elder, the volume continues with extensive sketches of descendants, all thoroughly documented, in Register format, plus some of the author's interesting innovations explained in the Preface. Bethuel Riggs was born in New Jersey, married in North Carolina, resided also in Pennsylvania, Virginia, Georgia, Kentucky, and Ohio, and died in Missouri. Extensive Revolutionary War pension and probate files provide copious detail. Eleven appendices contain transcriptions of various records. Illustrations include maps, charts, and photographs. Another interesting aspect of this work is the link to the author's website, which includes the full census information omitted here in order to save space. Citations, however, allow the reader to check the online images himself. Anyone approaching this volume will do well to begin by reading the Preface in order to appreciate the enormous scope of the research involved. This book received the 2007 Donald Lines Jacobus Award from The American Society of Genealogists. This superb genealogy has already become well-known in the genealogical field, culminating [in] its receiving the American Society of Genealogist[s]’s Donald Lines Jacobus Award for 2007. After co-founding the animation firm Pixar, the author has turned his talents to genealogy and is already publishing widely, including articles in this journal, and two full genealogies. The current work is the first of a multi-volume series planned to cover the descendants and antecedents of Edward1 Riggs, who settled early in Roxbury, Mass. Bethuel Riggs (1757-1835) was an Elder (or minister) of the “Regular Baptists,” which meant that they were Calvinists, although John Calvin’s doctrines seem to have become quite diluted by this time; most significantly, they still held to Calvin’s belief in “Limited Atonement,” that is, the doctrine that Christ died for the redemption only of the “Elect,” who had been chosen since the beginning of time for salvation. This necessitated a belief in predestination as well. Bethuel, as the author points out, suffered from wanderlust and moved frequently from state to state and community to community. But, unlike Johnny Appleseed who spread seeds wherever he went, Bethuel started Baptist churches, a number of which continue today. Although he was born in New Jersey, most of his early descendants settled in the mountains of Appalachia ad Missouri. Surprisingly, his youngest son became a strong Mormon, who finally settled in Salt Lake City, obviously estranged from his siblings. The central mystery in this work is the parentage of Bethuel Riggs. Using both traditional genealogical methods and DNA analysis, the author shows that Bethuel must have descended from Edward1 Riggs or from one of Edward’s male-line ancestors. An article by Smith and Robert Charles Anderson in the most recent TAG (82:120-29) begins the task of sorting out the English family, again using DNA and traditional methods. Seldom have we seen research as thorough and well documented as it is in this volume and seldom have we seen such skill in analyzing genealogical problems. This is a work that should be acquired by all genealogical libraries to serve as a model for their patrons in publishing their own research.